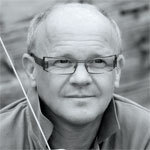 Christian Lindberg’s career as a conductor was initiated when the Royal Northern Sinfonia persuaded him to conduct a programme in October 2000. A stunning review in The Guardian convinced him to continue, and within a year he had been appointed music director of both the Nordic Chamber Orchestra and the Swedish Wind Ensemble, going on to lead them both for the next nine years. Since 2009 he has been principal conductor of the Arctic Philharmonic, and has recently extended his contract with that orchestra until 2019, as well as signing a five year contract as music director of the Israel NK Orchestra. Furthermore Christian Lindberg appears frequently as guest conductor with orchestras such as the Nippon Yomiuri Symphony Orchestra, the Royal Liverpool and Royal Stockholm Philharmonic Orchestras, Swedish Radio Symphony Orchestra, Danish National Symphony Orchestra, the Helsinki and Rotterdam Philharmonic Orchestras, Antwerp Symphony Orchestra, Giuseppe Verdi Symphony Orchestra of Milan, RTVE Symphony Orchestra, Taipei Symphony Orchestra, Simón Bolívar Symphony Orchestra and Nürnberger Symphoniker. Lindberg conducts on a number of highly acclaimed discs, among which the award-winning series of symphonies by his compatriot Allan Pettersson with the Norrköping Symphony Orchestra deserves special mention. He also has a uniquely wide-ranging discography as a trombonist.